How often have you thought about lowering the air temperature inside a warehouse, plant or company? How much would your business profitability increase with adequate air renewal? Which system consumes less energy? If you have ever asked these questions, you have come to the right place. Biocool is a benchmark company in the evaporative cooling sector. The professionals who work at our company are specialists in the best evaporative air handler on the market. Our customers’ satisfaction over the years is our proof of certification. And our motto in every action we take: respect the environment. Nature is our ally in the operation of Biocool evaporative air cooling. She gives us ideas for developing the most innovative air renewal systems. Thanks to this, we have achieved the perfect equation for combating heat. Heat is a manifestation of the energy produced by molecular movement, causing temperatures to rise, bodies to dilate, solids to melt and liquids to evaporate. It is the feeling you experience when the temperature rises. It is measured using two magnitudes: heat’s intensity and its amount. Heat stress: This appears when people have to work in a very hot environment. It is the result of combining environmental heat, heat generated by the physical activity itself and heat caused from work clothes. Low productivity and occupational accidents: Workplace temperature has a huge influence both on the degree of productivity and on accidents at work. Sick building syndrome from lack of ventilation: A number of illnesses stemming from air contamination in closed spaces, for example, migraines, dizziness, skin irritations and the appearance or aggravation of allergies. Poor use of air conditioning: This causes sudden changes of temperature, which can cause colds, throat inflammations and even respiratory infections or muscle cramps to appear. The way an evaporative air handler works is simple. Air is attracted into the cooler by a powerful yet silent fan. It is wafted through a number of water-soaked pads, absorbing some of the heat through a process of natural evaporation, producing a fresh breeze. The temperature of circulating air oscillates at 6–20ºC less than outdoors, circulating fresh air with an approximate temperature of 20–25ºC. The unit contains systems and automated devices that minimise maintenance and make the system flexible enough to adapt to every application. How does the evaporative air handler work? 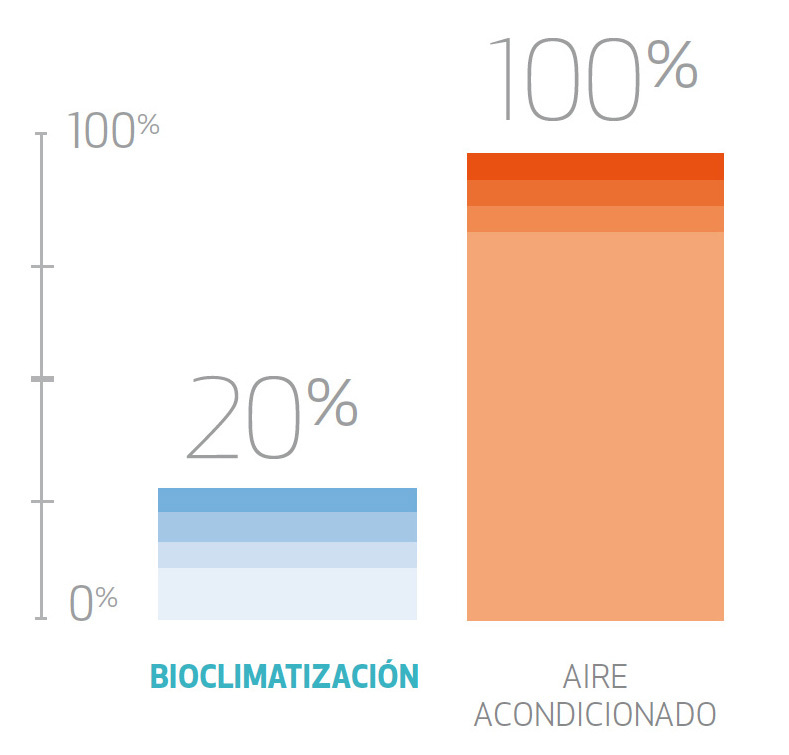 Evaporative cooling is not only a highly economical cooling method, but also healthy and ecological. This cooling system enables constant air renewal, improving air quality since the air enters clean and is filtered within the space, removing unpleasant odours, smoke or gases, and letting you leave doors and windows open.